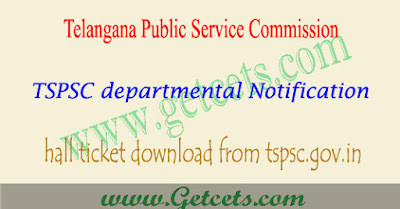 TSPSC departmental test hall tickets 2019-2020 May/Nov download : Telangana departmental test hall tickets is released. Employees who had applied for this TS departmental test exam can check this TSPSC departmental test hall tickets 2019 for May/Nov session and download immediately. Applicants can directly download the call letter from official website tspsc.gov.in. After completing the exam tspsc officials will be announced TSPSC departmental test results 2019-2020 on it’s portal. So we request the employees to download this Telangana departmental test exam admit card 2019 as soon as possible. Without admit card candidates are not allowed to write the exam. Show your TSPSC departmental hall ticket 2019 whenever the invigilator asked to show. The TSPSC Department Test exam will conduct from June **, 2019 where huge number of candidates are going to write the test. Hence, the procedure to download TSPSC Hall Ticket 2018 has given below. Earlier TSPSC officials has released TSPSC departmental test notification 2019 for May session and Successfully completed of TSPSC departmental test online application process now they are going to publish hall tickets to conduct exam. Candidates who have applied for a Telangana Departmental test for GOT, EOT and Special Language Exam now they can download admit cards available on tspsc.gov.in. Telangana departmental test Exams will be conducted in Adilabad, Karimnagar, Medak, Nalgonda, Nizamabad, Khammam, Warangal, Mahabubnagar, Rangareddy and Hyderabad district centres. TS Departmental test Conducting on July ** , 2019. The mode of examination is objective type Duration of the test 2 hours. i) All the Tests except the Language and Survey Tests will be in Objective Mode. ii) These Objective papers shall be conducted in CBT (COMPUTER BASED TEST) method of examination on On-Line mode and the candidates have to attempt the exam accordingly on computer systems provided by the Commission in the examination centres allotted to them on the scheduled dates detailed in Time table in Annexure I.
iii) P.C.Nos. 5,6,7, 19,28, 36,49,67, 37, 58,74 pertaining to Language papers and P.C.Nos. 69,87,109,110,111,112,116,117, 118,119, 120,121, 122,133,134 & 135 of Survey & Settlement papers will be conducted in Conventional/Descriptive Mode. iv) The Duration for all objective type tests shall be of (2) Hours and duration for descriptive type tests shall be of (3) Hours except for Second Class Language test which will be of two (2) Hours duration. v) The Candidates appearing for Conventional papers (Descriptive Exams) will be supplied answer books attached to O.M.R Sheet and the candidates have to answer in the answer book with Blue or Black Pen only. vi) The Questions for Departmental Tests will be in English only. However for (i) “Surveyor’s Test” (Higher Grade / Lower Grade) (ii) “Survey and Settlement Surveyor’s Test” (Higher Grade / Lower Grade) and (iii) “Translation Tests”, question papers will be in the chosen language, besides English. Frankly ask us by comments and share this TSPSC departmental test hall tickets 2019 May/Nov article with friends on social media for appreciation for us and we may again continue for the TSPSC departmental test hall tickets 2020 May/Nov and TSPSC departmental test Result 2019.